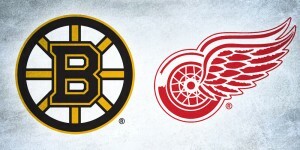 For the last two decades, the NHL has dedicated every November to Hockey Fights Cancer, a fundraising campaign supporting the American Cancer Society, Canadian Cancer Society, and Movember Foundation. Throughout October and November this year, each team has a dedicated Hockey Fights Cancer night to help raise awareness and funds for Cancer patients and their families. From in-game tributes to jersey auctions, every team has their own way of supporting this philanthropic effort, and of course goalies around the league have commissioned special masks to show their support as well. 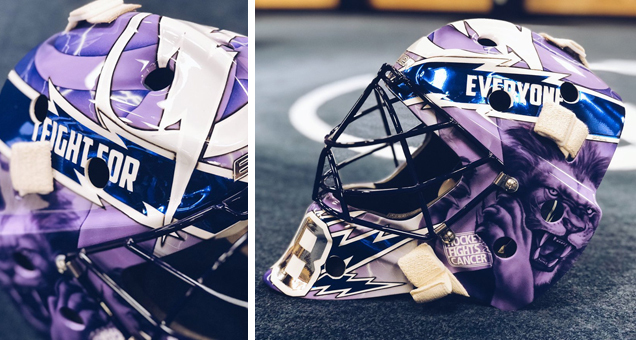 Read on to see the different Hockey Fights Cancer masks that are being worn this month, and learn more about the stories behind them. Domingue also told NHL NOW that he’d continue to wear the mask at least through the end of November, which is great news given how beautifully this design came out. Leroux did a great job of showcasing the children’s moving artwork to really let it shine, a quality that transcends anything aesthetic. 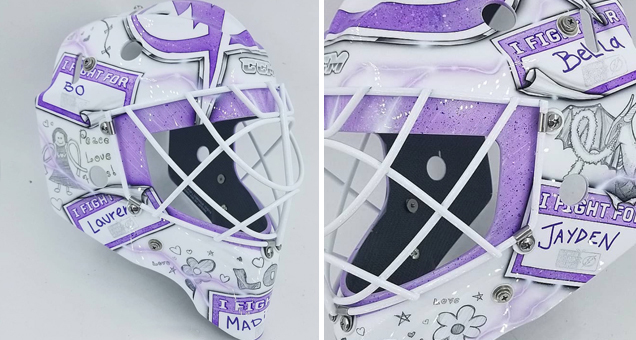 Domingue’s fellow Tampa Bay netminder Andrei Vasilevskiy also commissioned a special mask for Hockey Fights Cancer night, once again working with long time artist, Sylvie Marsolais. 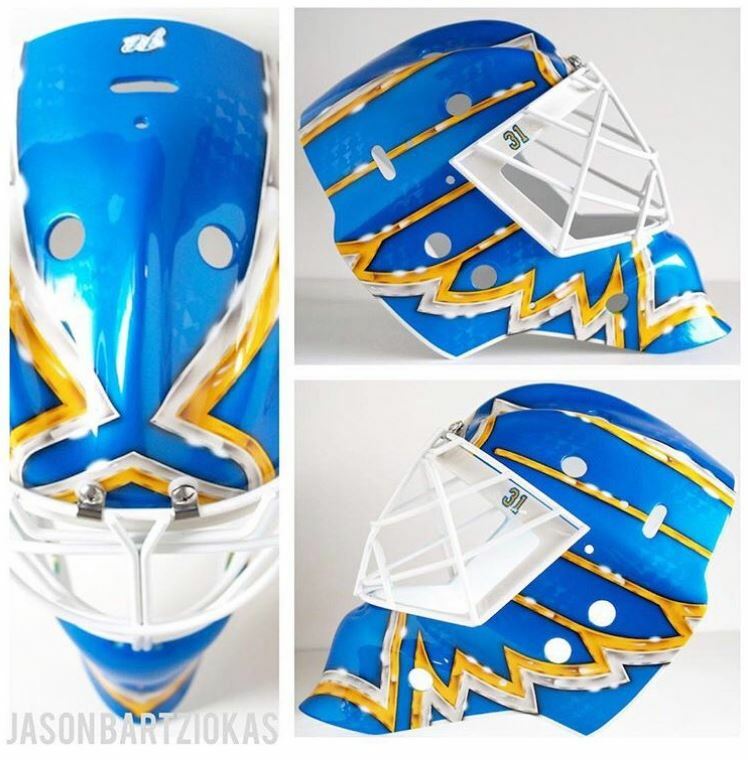 With the goaltender now being known for having sub-zero paint on all of his masks, Marsolais found a way to smartly incorporate the color changing technology and Tampa Bay blue into the predominantly purple design. Using the blue metallic foil around the top to highlight the words “I fight for everyone,” as well as in the lightning bolts around the chin, the blue that’s revealed in the cold looks at home with the rest of design. With Tampa’s HFC night having already passed, the mask is now being auctioned off to support the league’s fundraising efforts. The auction ends on November 30th though, so if you want to place a bid, act fast! 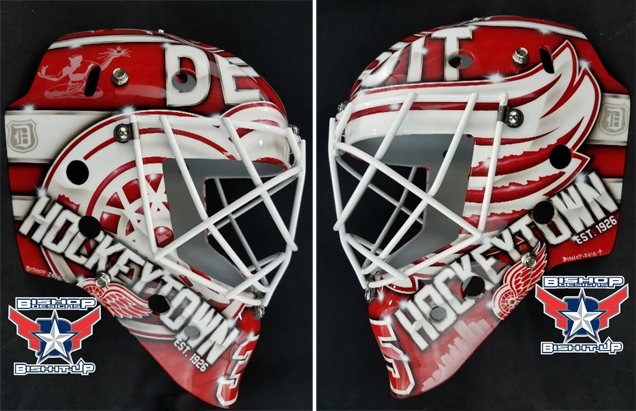 No stranger to donning fantastic charity masks, Jimmy Howard worked with long time artist Ray Bishop to commission his latest Hockey Fights Cancer mask. 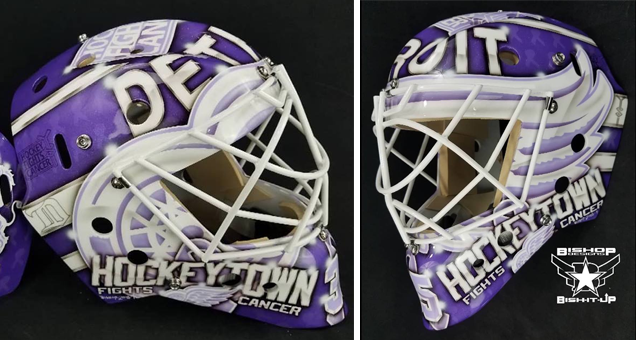 Almost an exact replica of his regular season bucket, Bishop added a few special touches like the words “fights cancer” underneath “Hockeytown,” a purple ribbon on the chin, and the Hockey Fights Cancer logo on top. 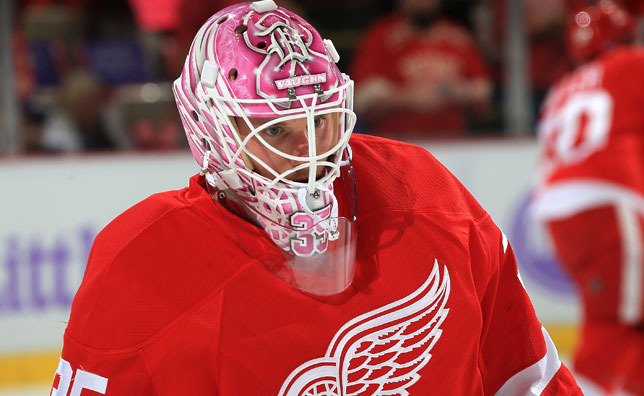 I really liked this mask when it was first painted in red, as the use of the Wings’ logo wrapping around the front is super dynamic and unique, and fortunately it looks just as great in lavender. 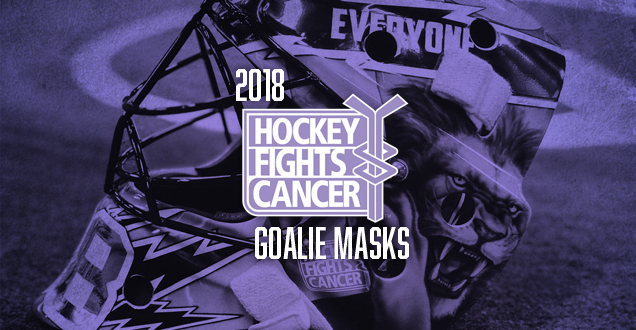 Since Detroit’s HFC night has since passed, the mask is now up for auction supporting the American Cancer Society’s Road to Recovery Program. 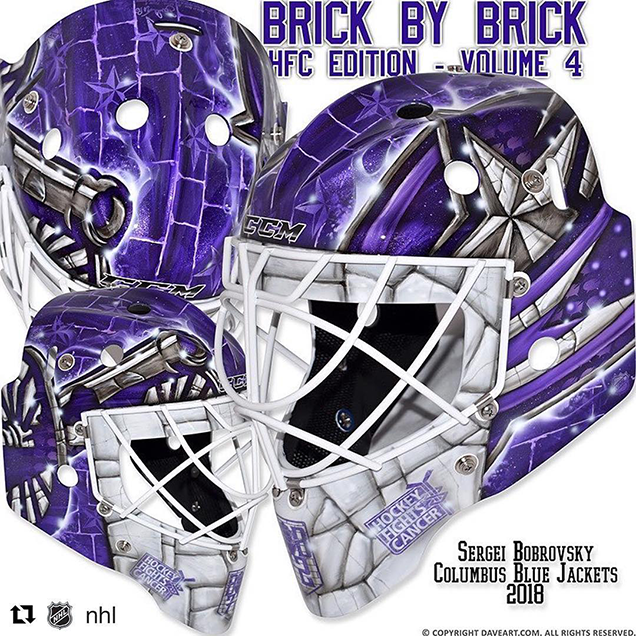 While Columbus’ HFC night isn’t until November 15th, Bobrovsky has been wearing his Daveart Hockey Fights Cancer bucket all month long. 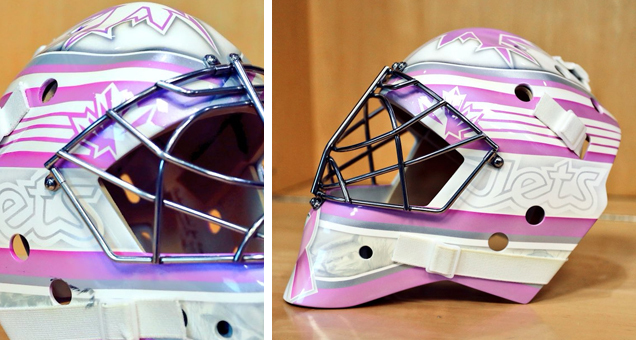 Preferring not to stray far from his regular mask design, Gunnarsson created an all-purple variation for Bob to sport throughout the month of November. With the Blue Jackets’ logo on the left and the cannon on the right, the only additions here were the Hockey Fights Cancer logos stenciled over the stones around the chin. 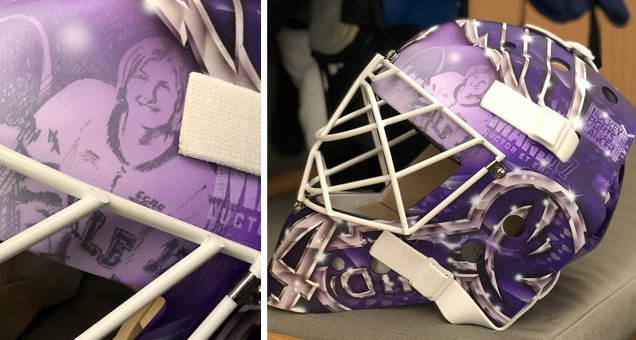 Also taking a personal approach with his Hockey Fights Cancer mask, Chad Johnson’s lavender bucket features beautiful black and gray portraits of former Blues players Barclay Plager, Jimmy Roberts, and Doug Wickenheiser, and late St. Louis sportscaster Dan Kelly. 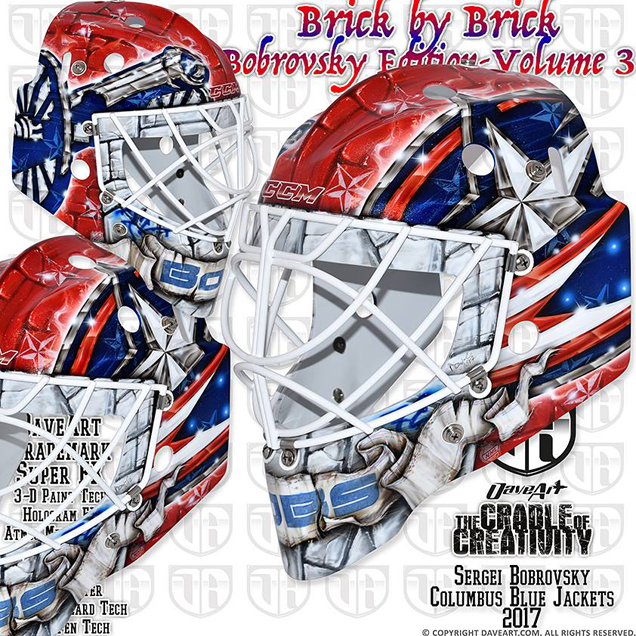 The overall composition is somewhat similar to his regular masks, painted by Jason Bartziokas, with large Blues logos on either side and a small “31” under the cage. 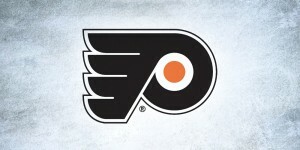 Aside from the obvious color change and incorporation of the portraits, the artist also included a purple ribbon on the chin and a large “Hockey Fights Cancer” logo top and center. 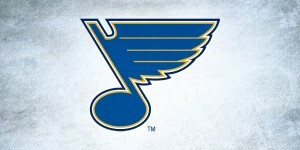 The Daveart mask includes the Blues’ logo on top and trumpet on the sides with a subtle portrait of Mandi wearing her Yale jersey next to her favorite phrase, “Luctor Et Emergo,” Latin for “Struggle But Emerge.” The Mandi Schwartz Foundation‘s “Mandi17” logo, for which Allen’s mask will later be auctioned off to support, sits over the saying as well. 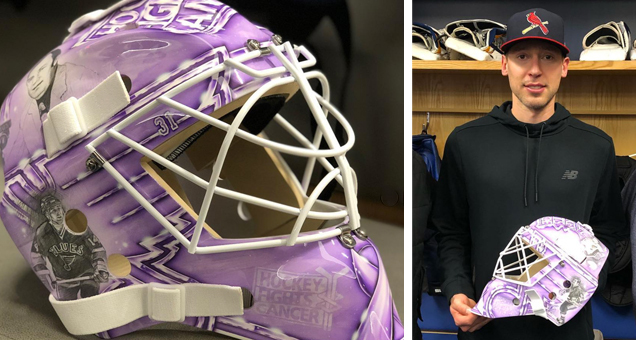 Keeping with his signature clean, crisp style, Hellebuyck’s Hockey Fight’s Cancer mask does a great job of using the Jets’ brand with the lavender color palette in a seamless manner. While the Jets’ HFC night isn’t until the end of the month, the goaltender has already been wearing the Eyecandyair mask in games, showing his support all month long. Along with the team’s warm up jerseys and player-worn ties, Hellebuyck’s mask is expected to be auctioned off at the end of the month to support the team’s fundraising efforts, so stay tuned for more details on bidding!